Today I am sharing my own Homestead Highlight and my family's experience in this adventure of backyard farming. The experience of homesteading, and the process of sharing that experience in this space has inspired me and encouraged me in so many ways. I thank you for reading and sharing here in this space. As a thank you, I would like to announce that starting Monday, I am releasing my first ebook: The Modern Homestead: A Guide to Starting Your Journey. 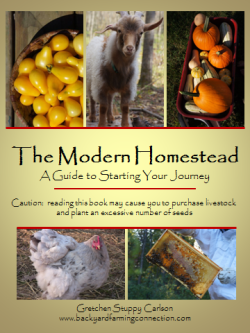 This 50+ page book provides an overview of some of the things you may choose to do as a homesteader, looks at some of the challenges you may face when homesteading, and helps you set goals and move forward with your dreams. For a limited time, this book is free when you subscribe via email to the Backyard Farming Connection. You can subscribe today, and I'll send you your free copy on Dec 10th. Gretchen lives with her husband and three young children in Upstate NY on an emerging 2.5 acre homestead. She spends her days chasing children, chickens and the elusive weeds that spring up out of nowhere in her garden. You can read about her adventures at The Backyard Farming Connection and Simple and Joyful Living. I officially started on this adventure about 2 years ago when we bought a home in upstate NY on 2.5 acres. But really, we started on this journey years ago. For as long as we’ve been together – about 11 years, my husband and I have been reading and thinking and planning, with the idea that ‘someday’ we’ll have the space, time, resources and all the other things we needed to have our homestead. We were already making choices to buy at farmers markets, conserve, and grow small herbs and veggies in pots, but our idea of our homestead really emerged will the purchase of a bit of land. After college, Dave and I worked on several different tall ships that run education programs. When at sea for long periods of time, a sailboat is a perfect example of a temporary self-sufficient homestead – minus the whole growing your own food aspect. The mentality that goes along with living in this way really propelled us toward homesteading. Our backyard is rapidly changing as we fully embrace this lifestyle. Our 2.5 acres is in a relatively rural, wooded area outside Saratoga Springs, NY. Gradually we’re clearing back some of the trees and enriching our heavy clay soils. Because our soil and drainage is poor, most of our gardening is done is raised beds. We’ve brought in about 35 cubic yards of soil and compost, and are finally reaching a point where we can start supplying our own compost needs. Since we moved in we’ve planted 11 fruit frees, raspberries, blueberry, blackberries, grapes, a put in several beds of strawberries. Our gardens are a way to supplement our food and provide organic, healthy produce as much as possible, but we aren't at the point yet where we can provide for all of our needs. We started with a few hens for eggs, a hive of bees, and recently got 2 Pygora goats for their fleece and possibly for some milk. The chickens live in a self built (we built it not the chickens) tractor that we move to fertilize the garden beds, although they are currently housed in the pasture with the goats. Since we don’t have a barn on our property, we recently put up a large shed that will house the chickens and goats. There have been so many little mistakes we’ve made, but luckily at this point they are all little. We started with just 5 hens, and quickly realized that we need a few more to maintain the egg consumption of 5 people. We are still working out how much of which crops to plant, and often find ourselves overwhelmed with one thing, and completely lacking in others. We also (I also) have a habit of jumping into projects before I’m completely ready, next time we bring home two goats it is probably a good idea to have a fence up and shed completed so they don’t need to live in the garage for a few days. Oh, and our bees swarmed in our first year – still not sure what went wrong! I am so grateful that our successes outnumber our mistakes. We’ve succeeded here in so many little ways. We eat fresh food from our garden, we cook free-range eggs, our bees pollinate our garden, and we continue to get pleasure from all the little things we do. Probably our biggest success is that we haven’t lost a hen yet despite fox, raccoons, dogs and other predators in the area. This is probably mostly due to our border collie mix who patrols our backyard. What plans don’t we have for the future! More, more, more! This life is addictive. Dave really wants some heritage turkeys, I’m thinking another goat, guinea hens, more laying hens (this spring) and the list goes on. Immediately we have no plans to build more garden bed,s although we want to grow hops next year and perhaps a few other perennial crops. Some of these plans will be realized soon, and some will wait for the next house and more land. Dreaming up the next steps is a big part of the fun! Great story Gretchen! I get so inspired every time I read someone's story. Thanks so much for doing this, it is such a great resource to be able to share and learn from others. It gives me such a great feeling to see so many wanting to get into backyard farming and homesteading! I am really looking forward to reading your book! Thank you for sharing your story. I always like to read your posts about other homesteaders. Looking forward to your book. Congratulations! I just loved reading more about your story and homestead! So exciting what you have planned for the future. Happy to hear you're thinking about guineas :) I agree, dreaming up the next steps is a big part of the fun. I feel like it bonds us even closer when my husband and I talk about our future together and what we want to accomplish on our homestead. Congrats on your first e-publication.I so look forward to reading it. We only have 1/2 acre inside the city limits but we are developing it into a bounty of fresh fruits, veggies and flowers. We are also avid birders and hope to share our bounty with our free flying feathered friends and our 8 banty hens. Keep up your very good work and Best success in all your efforts. Hi, this is Heather from Green Eggs and Goats, Your pygoras are beautiful!! Great, now I need more goats! I signed up via e-mail, I can't wait to read your e-book! So much neat stuff that you're accomplishing! I wanted to ask what kind of hen you are showing in the last photo. I have one like her but the colors are exactly opposite! Since she was given to me as an egg, from a mixed flock, I have been kind of wracking my brain (and the internet), lol. The closest things I've come across are a black sexlink cross and that the feather pattern is called "pencil laced". Not very many breeds have the little peacombs. She lays glossy white eggs (small, and she is small too). Anyway, she's my favorite of them all and I'd love to know - if it's possible that the same breed might have color genes competely reversed? LOL! Thanks for sharing your journey, it's inspiring! She's a gold laced Wyandotte - although I have a hunch that she might be a bit mixed too - she lays brownish green eggs. If you have a photo of your chicken I could post it to my facebook page and see if anyone knows the breed, that sometimes works!